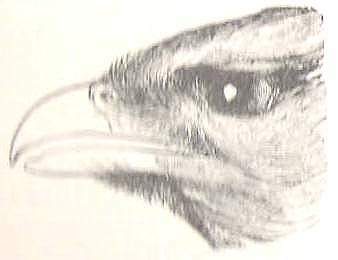 The Caracara is a South American bird, so called by the natives of Brazil, first described and illustrated by Marcgrave in 1648 (Historia Natural do Brasil, page 211). In 1782 it became the Falco tharus of Molina (Sagg. Stor. Nat. Chili, p. 264), and is now in the early twenty first century the Polyborinae subfamily within the Falconidae family of modern ornithology. The Caracaras are a small group of birds, which have a Falconine structure and Vulturine habits, amongst other peculiarities. 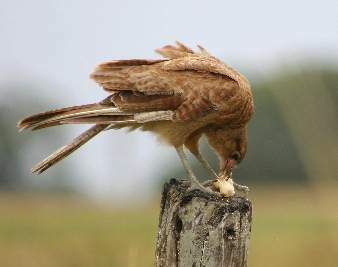 These birds with some others, are the "Carrion-hawks" which were frequently mentioned in Darwin's Voyage. It is worthy of remark that, according to the 19th Century writer Mr. Hudson (ut supra), after the introduction of large herds of cattle to the plains of South America the abundance of food supplied by their carcases resulted in a great increase in the numbers of these birds. They are large birds, 40 to 60 cm with a wingspan of approximately 130 cm. It is not a specialized predator but is mainly an opportunist and scavenger, feeding on insects, amphibians, rodents and any other easy prey. They have long legs, and all the members of this group are said to walk or run on the ground - a peculiarity not possessed in perfection by any of the other Falconine birds with which they are generally associated. The most well-known type is the Crested Caracara (Polyborus plancus) who is resident from Southern USA to South America. The bare skin around the eyes of the Crested Caracara can change colour in the space of a few seconds. The call of the Crested Caracra is a low rattle. On the Falkland Islands the Southernmost type lives, this being the obscure Falkland-caracara (Phalcoboenus australis).